Photolightning is designed to be one of the easiest photo software you'll ever use. 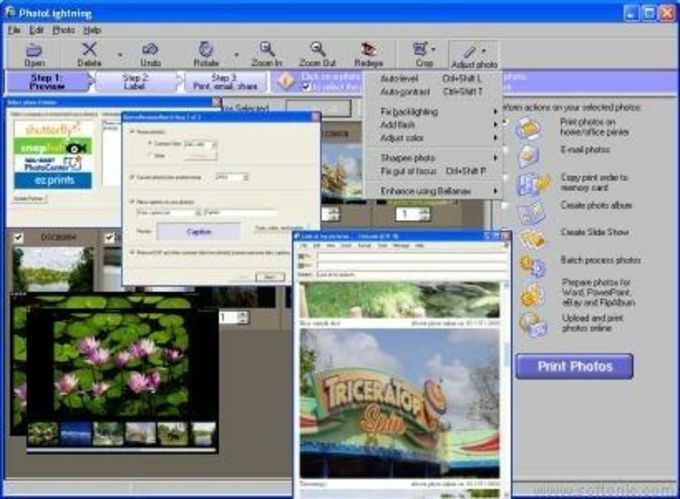 Just plug your digital camera into your computer to preview your photos. From there you can do whatever you like -- rename them, edit them, print them, email them, and much more. You can choose from a variety of preset folder-naming schemes that make it easy to find your photos, or create your own each name time. Photolightning can eliminate the red eye in your photos with just one click. The red eye reduction method ensures that we leave the eyes looking lifelike by not eliminating the pupil reflection. Using the red eye reduction is easy. Simply draw a circle around the red eye and click.